The first thing you notice about Man Out of Time, singer Broderick Smith’s auto-biography, is the beautiful production values. This is an impressive looking book, gloriously illustrated with numerous photos, press clippings, album covers, posters and all sorts of memorabilia relating to the man in question. The front cover image of the young Smith, with its sepia toned design, portrays him as having just stepped out of the Old West staring into the shining light of the modern world. Man Out of Time is an appropriate title. Starman Books know how to present a quality product. If the standard edition is striking then you’ll be amazed by the more expensive, and expansive, 101 Books Super Deluxe Edition which comes in a clamshell slipcase with the addition of a 3-CD boxset of Smith’s recordings, Then & Now 1967-2017, and each personally signed and numbered by the singer. That edition is limited to 101 copies so if you’ve a mind to snare one of those, check out the Starman Books website pronto (starmanbooks.com.au). So, that’s the ‘form’ of Man Out of Time (what it looks like). What about the content? As with any good auto-biography, or memoir if you like, Smith tells his story with a great deal of insight. He takes the reader from childhood memories of England, of immigrating to Australia with his family in May 1959, of growing up in Melbourne, his discovery of the blues and joining his first band, then on to conscription in the late 1960s. Following that, the real rock ’n’ roll journey begins: touring and recording with Carson, The Dingoes, Big Combo, many other bands and as a solo artist. It’s all told in matter-of-fact detail, with Smith’s wickedly dry sense of humour infusing proceedings with a huge dollop of ‘Boys’ Own Adventure’ elements. Smith obviously thrived on the band camaraderie involved with creating music, although he admits that he could be a grumpy and prickly character at times. Still, he’s more attuned to self-deprecation than trying to settle old scores or pointing out other people’s faults. 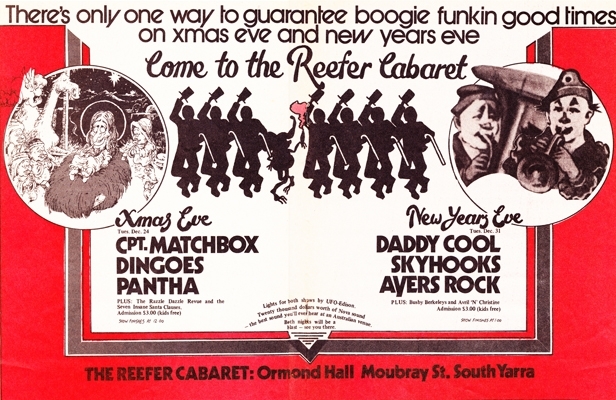 The Dingoes were an immensely important part of Australian rock ’n’ roll history, not least for the uniquely local disposition they developed and projected. Alongside fellow band members guitarists Kerryn Tolhurst and Chris Stockley, Smith was able to take the music in new directions. He writes in the book of the band’s early days, “As the music evolved it was clear that we were merging bush music with R&B and writing a lot of songs that reflected who we were as people and where we lived. We would put Australian place names in the songs to give the music identity”. The sections dealing with The Dingoes’ time touring and recording in the US, circa 1976-78, are particularly revelatory. The band received positive reviews and notices in the US and seemed on the cusp of stepping up to the premier league but the odds were inevitably stacked against them. Did you know that in 1977 the band was due to open on tour for legendary Southern rockers Lynyrd Skynyrd? It was going to be their big break. Tragically, on 20 October, just weeks before the tour was to start, three members of Skynyrd died when the group’s plane crashed while attempting an emergency landing. Not only was it the end of the American band but also it saw The Dingoes’ chances slip away. Broderick Smith is a great character and marvelous story teller, a genuine music enthusiast whose roots music has incorporated R&B, soul, country rock and folk. His voice is immediately recognisable and, while he rarely touches the pop charts, he’s entirely relevant to this day. This book provides the perfect glimpse into why.